The 1990 World Sports-Prototype Championship season will be remembered as much for the off-track acrimony as for the action on the circuit as the longer­term future of the series - and FISA's commitment to it - came into question. Local and national politicians were drawn in, and the arguing did nothing at all for the image of motor racing, or for the less committed manufacturers' faith in the future of the series. The issue was finally resolved - in the short term ­in February. 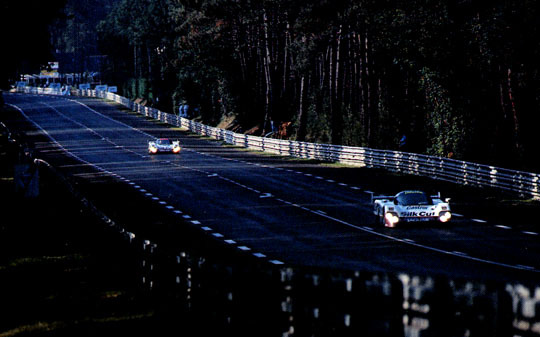 FISA agreed that the 24 Hours could go ahead as a non-championship event in 1990, as it had in '89. In return, the ACO kept its TV rights, built the two chicanes which would for ever change the character of the race, and promised to construct a new pits complex for '91. Coincidentally, the agreement was reached some time after the deadline for entering the WS-PC. Thus teams had to make a decision about registering for the series without knowing if the main race of their season would have championship status, or indeed if it would take place at all. This worked two ways: for some, such as Mercedes, there was relief that the race would not be compulsory. For others, there was anger that they had been 'conned' into registering for the full WS-PC season for the second year running, when they really wanted to concentrate only on the 24 Hours. The race went ahead with its one-off status, without Mercedes but with a full grid made up by cars from outside the registered WS-PC entry. Even with the chicanes, the event retained its popularity and was the usual huge success for the ACO. This was a timely political move by Balestre, for during the course of the season it became increasingly apparent that the field for 1991, supposedly the first year of the 3.5-litre normally aspirated formula, would be much smaller than FISA had anticipated. While Peugeot built its car from scratch, and Mercedes and Jaguar pressed ahead with all-new atmospheric contenders for '91, other manufacturers lagged behind in terms of both technical development and boardroom commitment. In March FISA bowed to the pressure and announced that the turbos would get a further stay of execution and would be able to compete in 1991 - as long as the rules were written to allow the new atmo cars a clear advantage. When those rules came in June, they were not well received by the stragglers, notably Porsche, Nissan and Toyota. Some form of engine air restrictor had been anticipated, but instead a hefty 100 kg. weight penalty was adopted, and turbos were banned from the front ten spots on the grid. At least Toyota and Nissan had 3.5-litre programmes on the horizon, but for Porsche, with its army of privateers, it was bad news. Struggling in Indy cars, and committed to Grand Prix racing with Arrows, the German marque now had no immediate future in Group C. It could offer nothing to the customers, and its own works 3.5-litre project had been put back to 1992, or beyond. In an attempt to persuade FISA to cut the weight limit, Stuttgart announced that the 962 would not be developed in 1000 kg form, and advised its customers not to contest the World Championship. Even the most enthusiastic series supporters had little to cheer about during the summer. In a shoddy affair, the Jarama event was disgracefully cancelled at a week's notice, while the teams were still busy at Le Mans. The thorny subject of series promotion also came to the fore. A tiny crowd at an abysmally low-key Spa meeting in June was the turning-point for this, and the manufacturers started to ask serious questions. Bernie Ecclestone, the man responsible for promotion, blamed it on their own lack of support. To a certain extent he was right, but equally the manufacturers were not impressed with Bernie's apparent lack of enthusiasm for the sports car series, into which they were pouring a lot of money. Better news came in September. Aware of the fuss, Jean-Marie Balestre reaffirmed FISA's support for Group C at the Donington meeting, and again at the Italian GP a week later. The week after that came the Le Mans agreement, proof positive that Jean-Marie did want the series to succeed. Important changes were also agreed at that day's Sports Car Commission. Significantly, the races were cut to 430 km from the intended 1991 length of four hours, which had been put forward by Ecclestone as an ideal TV package format. Keen to differentiate Group C from F1, the manufacturers originally went along with the four hour plan, until they realised that a) nobody wanted to watch such lengthy races, on TV or otherwise, b) it would cost a fortune to make the new F1-style engines last that long, and c) shorter races would give less chance to those ballasted turbos in '91. FISA hac also planned to make the World Championship one exclusively for representatives of road car manufacturers, but when it was realised that the much-needed private teams were less than enthralled with this idea, the teams points format was retained.